Today was the last in our series of Back to Basic Wonderland Wednesday summer sessions. The focus of the final two sessions was on using SketchUp as a modeling tool for Wonderland worlds. For those of you who were not able to make the sessions, I thought I would provide a quick recap of the material that we covered. Even if you’re not particularly interested in SketchUp, the tools we used for the workshop can be applied to many other teaching and collaboration scenarios. To support the workshop sessions, WonderSchool generously donated the use of their VNC server. The server was running Windows with SketchUp and DropBox installed. 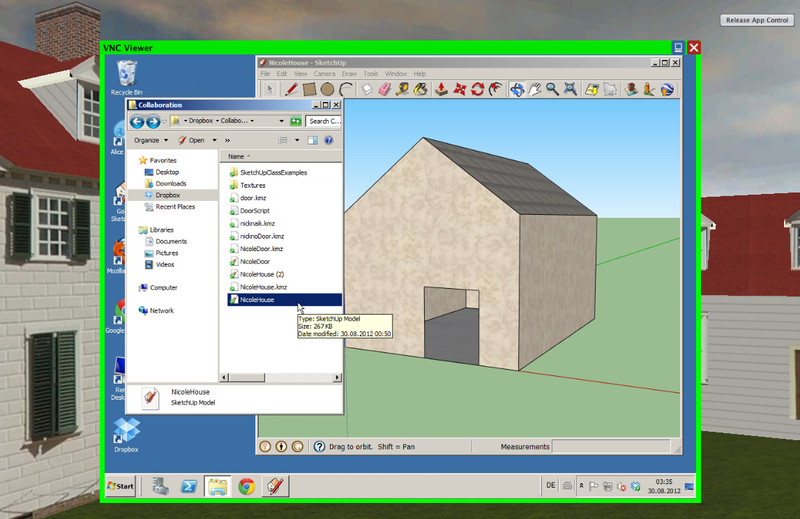 I added a VNC Viewer to the world so everyone in workshop could watch as I demonstrated how to use SketchUp. At the beginning of each session, I shared the shared DropBox folder with each participant. I seeded the folder with a set of textures that we used during the session as well as a sample script to open and close a house door. As I demonstrated how to create models in SketchUp, I was able to save the models into the DropBox folder so each person in the workshop could have the models on their own computers as a reference. Some of the participants also shared the models they created in the DropBox folder. When someone in the session needed extra help, we added a Screen Sharer and had them show us their screen. That way, we could pinpoint where they were having trouble. It’s a lot easier to understand a problem when you can see the remote person’s screen. Introduction to SketchUp – this self-paced tutorial from Google is an excellent place to start. Creating and Importing Artwork for Non-Artists – this tutorial on the Wonderland web site shows how to use photographs to texture models in SketchUp and reviews the process of bringing the model into the world and adding capabilities. SketchUp Training – this page has links to hundreds of tutorials and video demonstrations so you can learn the specific skills you need for your particular project. In the workshop, we covered a few tips for using SketchUp specifically for Wonderland. Here’s a summary of the important points. Wonderland only supports a single texture per surface. In SketchUp, you can apply different materials to the front and back face of a single surface. Wonderland, however, only supports a single material per surface, so when you are modeling for Wonderland, you should always apply the same textures on both sides of a surface. This means that if you wish to make a house that has a brick exterior and a wallpaper interior, you need to make the walls double thick. That is, you need to give them just a little bit of width. If you do that, you can safely add different textures to the inside and outside walls. When you add materials to your surfaces, be sure to use textures and not the plain colors. SketchUp does not come with a very good selection of textures, but you can find many excellent free ones on other sites such as ShareCG, CGTextures, or WebTreats. The best textures are ones that are marked as “tilable” or “seamless.” Be sure to reduce the file size of any large texture before using them in SketchUp. Large texture files can significantly impact performance in Wonderland. You want the texture size to be as small as possible and still look good. Export to Google Earth (.kmz) format. When you have finished your model, save it, and then use File –> Export –> 3D Model to save the file in the Google Earth (.kmz) format. You can then drag and drop the resulting .kmz file into your Wonderland window and your model will be imported into the world. When you import a .kmz file into the world, you almost always have to fix the lighting to brighten up the model. To do this, right click on your model and select “Properties…” In the Object Editor window that opens, click on “Model Component” in the Capabilities list and uncheck “Lighting Enabled.” Once you Apply the changes, the model will more like it did in SketchUp. During the workshops, each participant created a simple house. We made the door a separate file so that we could bring that into Wonderland, align it with the door opening in the house, and animate it using EZScript. One tip for helping to align models is to always axis-align the models before you begin to position them. That is, make sure the Y-rotation of all the models you wish to align is set to 0, 90, or 180 degrees. You can parent the objects after you have them aligned and change the rotation, but it is much easier to work when all the models line up exactly with the world axes. Today was the last in the series of Back to Basic workshops. What other topics are you interested in having covered during future Wonderland Wednesday sessions? Leave comments here or post a message on the Wonderland Forum with your ideas. This guest post is a summary version of a longer report. 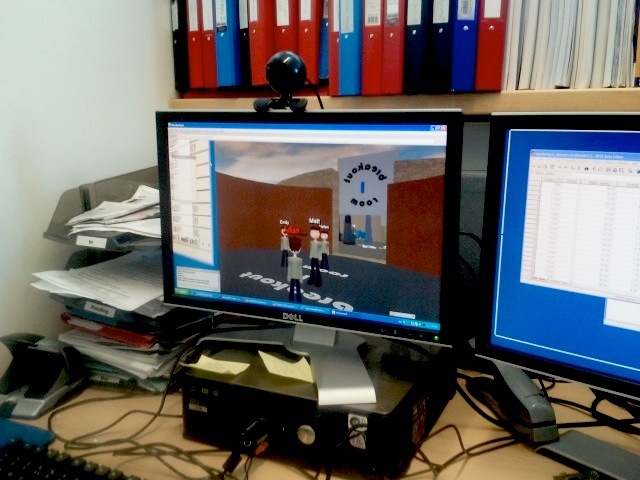 The Institute of Psychiatry (IoP) Mental Health Studies Programme (MHSP) is the first in King’s College London to trial the use of a distributed application, embedded within a virtual 3D environment, for teaching and learning purposes. The pilot trial was conducted on 15th August 2011 in an Open Wonderland (OWL) virtual environment. 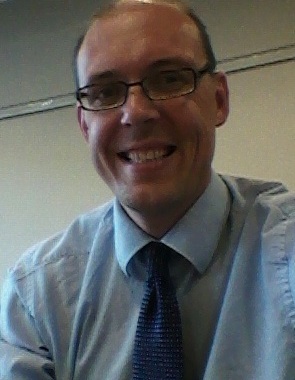 The content was designed by the IoP Education Development Manager (Fletcher) and hosted on the IoP’s Denmark Hill Campus LAN. The tutor and three students presented themselves as avatars and used the embedded SPSS statistics application together with the environment’s built-in audio facilities to interactively collaborate and complete a structured statistical teaching and learning exercise. Currently the IoP Mental Health Studies Programme teaches research methods to its 110 students via 90 minute lectures or practical workshops held once a week. There is some divergence between the theory that students learn in the classroom setting and the case examples they practise upon and their ability to apply this knowledge to the real data that they gather as part of their research projects. 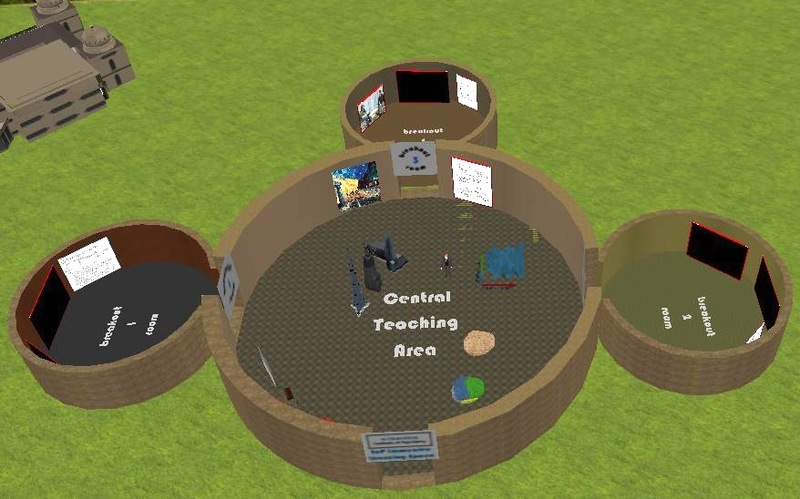 Since 2009, MHSP has contemplated the use of the OWL 3D virtual environment to target this need specifically by providing a new fortnightly problem-based learning session in which students participate interactively and collaboratively. The trial consisted of an introduction to the task by the tutor, a structured SPSS tasking lasting about 40 minutes during which the tutor and 3 students carried out simple SPSS exercises, followed by a more open-ended period of exploration of the world by the students. Fig 1 Aerial view of pilot MHSP environment when imported into OWL. Each of the three Breakout Rooms consisted of a VNC Viewer screen for displaying a distributed application, a screen for displaying a video and either a poster in the case of Breakout Room 1 or a PDF Viewer in the cases of Breakout Rooms 2 & 3 for displaying documents. In the Breakout Room 1, used in this trial, the SPSS statistics application was displayed in the VNC Viewer (Fig 2) which the tutor and students could interact with through their clients (Fig 3). There was also a video player screen which displayed a video produced by the University of Minnesota Department of Sociology on how to use SPSS. An in-world poster was used to display the instructions for the statistical tasks to be carried out in the trial. Fig 2. SPSS Application displayed in VNC Viewer in Breakout Room 1, with VNC controls. Fig 3. An example client screen used to interact with SPSS in the virtual world. The degree of prior familiarity with game technologies seems to dictate how quickly students can familiarise themselves with and navigate around the OWL environment. One student had such existing experience being an enthusiastic games player whereas the other two had to rely on more explicit tutorial guidance to get started. All three students, however, succeeded in becoming familiar and comfortable using OWL and none dismissed it out of hand as something they simply could not use. All three students have willingly adopted the collaborative style of learning that applications embedded into OWL are designed to foster. Their responses indicate that there is an optimum size group of students around a single application to make such collaboration work (no greater than 4 when one includes the tutor). The need to take control of the application in turns in order to interact with it, while making that interaction slow at times, has the benefit of ensuring all students can keep up with the task and have a chance to practically apply their knowledge through completing the task. All three students shared the opinion that working in groups collaboratively and learning more about statistics through communicating with each other was what they liked best about the exercise. The ability to talk to teach other using OWL’s audio facility and the need to take it in turns to complete the task encouraged such collaboration. An optimum group size for this application is about 4 students working together. Retaining concentration could be improved by enhancing visual and interactive content of the environment. This highlights the need to have architectural designers with proficient 3D design skills to build such content and programmers with proficient scripting skills to make it interactive. More sophisticated, ‘human like’ and individually distinct avatars to make online conversations more natural. The College-issued PCs did not support the 3D graphics necessary to render OWL’s customizable avatars. Delays of respective clients to render the world can significantly impair its use. This needs to be ameliorated by using a more dedicated and higher performance specification OWL client/server hosting solution. 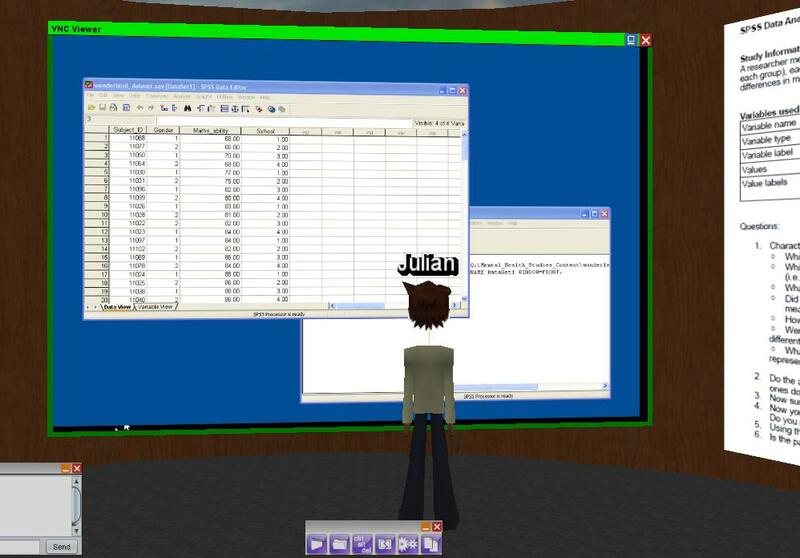 Using a virtual environment such as OWL can help students to further engage with and be more motivated to learn and apply statistics, supplementing and consolidating what they learn in their current classroom sessions by making such learning a more ‘hands-on’ activity. Even taking account of the limitations of this pilot exercise – e.g. a small group of participating students, and computer and network hardware not designed for anything as memory intensive as immersive virtual worlds – this pilot trial can be judged at the very least a qualified success. For the most part, the technology worked for the duration of the trial (far better than the Education Development Manager dared hope!) and none of the students dismissed using virtual worlds as part of their teaching and learning as a completely bad idea! In fact they were on balance positive about its potential. Taking the current pilot to the next stage will require a more powerful Open Wonderland hosted service as well as more appropriate client hardware. This is currently being investigated at the College level. Some further thought on the design of both SPSS tasks themselves from a pedagogical perspective and the content within the OWL environment will also need to take place. In particular, the personalisation of avatars will take on increased importance when more students will be in-world concurrently than was the case with this small trial. Finally, it should not be the goal of virtual worlds to replace what the MHSP currently does perfectly well using more ‘traditional’ methods such as class-based lectures and training courses. Rather, the purpose is to augment such activities through giving students increased scope to apply the statistical theory they are taught in class and in textbooks to practical data sets related to their own course of research. It was especially pleasing to note how students were happy to help each other and learn from each other in the collaborative in-world SPSS task. This is likely to help to inculcate wider transferable skills such as team working and proactive problem solving. You are currently browsing the Wonderblog blog archives for August, 2012.